Pic My Energy Mix app. A new web application calculates the sources of energy used by people in Michigan and Colorado and lets them adjust the mix on their screen to reflect their preferences. PicMyEnergyMix — developed by the Clean Energy Now Coalition, Engage Michigan and Resource Media — is still in the piloting stage, said Marissa Luna, Engage Michigan’s new media specialist. Developers hope to expand the app to more states and utility companies. “It shows you the types of energy that are being used by your utility to power your home,” said Luna. In Michigan, DTE and Consumers Energy customers can see what powers their homes — whether it is coal, natural gas or another resource — and the percentages of each. “Anyone who isn’t a DTE or Consumers customer can use the statewide utility average,” Luna said. Users can denote how much of each energy source they would like to use. The website adjusts the other percentages proportionately, Luna said. If a person favors only solar and wind power and selects exactly 50 percent of each, everything else lowers to zero. Meanwhile, the American Council for an Energy-Efficient Economy has found that Michigan is losing ground when it comes to energy waste, dropping from 12 to 14 nationally even after years of improvement, according to the council’s new report. Just three years ago, the council cited Michigan as the most improved state in the nation when it rose from 34 to 12. According to the Michigan Public Service Commission, families and businesses have saved $4.2 billion under Michigan’s energy efficiency standard, but Michigan’s momentum has stalled as other states continue to make progress with stronger standards. 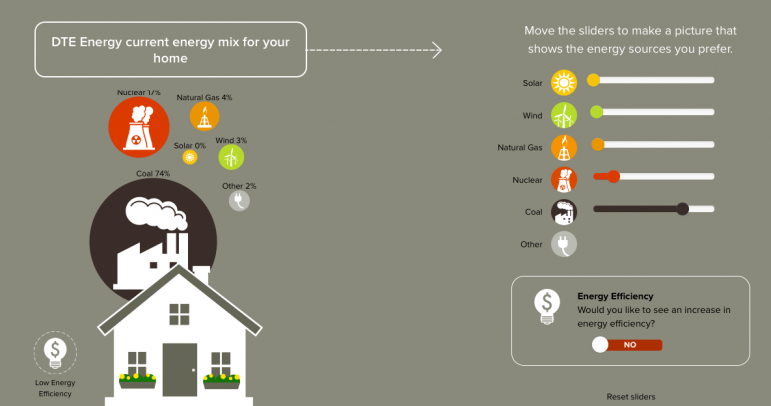 PicMyEnergyMix features a switch that people can turn on to convey that energy efficiency is their priority. And they can share their choices on social media. Michigan users can send an email with side-by-side pictures of their preferences and their utility’s current energy mix to Gov. Rick Snyder and Sen. Mike Nofs, the chair of the state Senate Energy and Technology Committee, Luna said. Also available is the statewide average preferred energy mix of everyone who has engaged with the app. So far, Luna said, most opt for solar and wind energy. “We wanted to find a way to give people more of a voice in the energy decisions that are being made by our elected officials,” Luna said. “[The app] is customized by local advocacy organizations with accurate data about the current energy mix for local utilities as well as information such as upcoming energy-related decisions in their state,” Jeff Cappella, senior program director at Resource Media, said in an email. Resource Media is responsible for the technical development of the web app.